After a water damage disaster with basement flooding, our restoration professionals at PuroClean Certified Restoration are concerned with drying everything as quickly as possible and restoring the property to a pre-disaster condition. This includes being aware of the unique properties of concrete, its reaction to flood conditions, and the unique challenges of drying that material. When the walls and contents are dried after basement flooding or other severe water damage, concrete areas are often assumed to be dried as well. New floor coverings are often installed right away. Within weeks, or perhaps months, customers may complain that the newly installed floor is defective. The real culprit, however, is not the flooring, but most likely excessive moisture remaining in the concrete and the condensation that can occur because of the dew point. Dew point is the temperature at which water vapor in the air begins to condense into water (or dew). As the air cools, its ability to hold moisture is reduced. If it continues to cool, eventually the air becomes saturated with moisture and then condenses into water droplets. Normally, a concrete floor is significantly cooler than the rest of the room. Condensation will therefore occur at the surface of the concrete long before it happens elsewhere in the room. Such condensation may form on the concrete even if the rest of the room, walls, and contents have dried to their normal condition. Contractors who are not restoration professionals may be unaware of this phenomenon and move forward with their restoration effort, including the installation of floor coverings. The damage-and-complaint scenario compounds when water-based adhesives are applied over a damp concrete floor. As moisture evaporates from the concrete, the water-based adhesive absorbs it. This changes the moisture content of the adhesive and prevents it from curing and becoming fixed (or permanent). Since the adhesive fails to become fixed, it will soften and move. Sometimes it appears as bubbles or blisters in certain flooring materials. When tile is applied, the adhesive may ooze or leak out along the edges of the joints or seams. People may believe that the flooring material is defective, but the root cause is premature installation of the floor covering. The use of water-based adhesives versus solvent-based has increased in recent years due to environmental regulations. Water-based adhesives perform very well under the correct conditions. However, when applied to a substrate with higher-than-normal moisture content, the failure rate increases dramatically. It is important to contact restoration professionals such as PuroClean Certified Restoration when concrete has experienced any type of water damage. Using the latest equipment and procedures, we can determine when the concrete is dry enough. The best method is to use a humidity chamber or humidity box. These are either manufactured boxes or bubbles of plastic taped to the floor. The chamber traps the moisture released from the concrete, eventually reaching equilibrium. Our water damage restoration expert carefully inserts a thermo-hygrometer into the chamber and measures the equilibrium humidity. Because concrete is hydrophilic (water-loving) this equilibrium humidity can often be in the upper 60’s. Any reading below 72% is sufficient to install carpet or tile flooring. Wood floors should have readings below 70%. If the concrete floor needs additional drying, air movement is the best way to hasten the process. Removal of the boundary layer from the surface of the concrete facilitates additional evaporation/drying of the concrete. The room humidity levels will indicate whether a dehumidifier is also needed. If the ambient humidity of the room is below 50%, a dehumidifier is probably not needed, but ongoing monitoring should be done to check for changes. Please note that each of the respective trades associated with installing floor coverings have established installation standards. All of those standards require the installer to determine that the subfloor (regardless of type) is in a satisfactory condition to allow proper installation of any floor covering. Regardless of the circumstances – dealing with water damage, fire/smoke damage, or mold remediation – call our PuroClean Certified Restoration. We are the Paramedics of Property Damage™. For all property damage situations, our professionals are standing by. They will mitigate the loss to prevent further damage and will then provide restoration services to return the property to a pre-loss condition as quickly as possible. 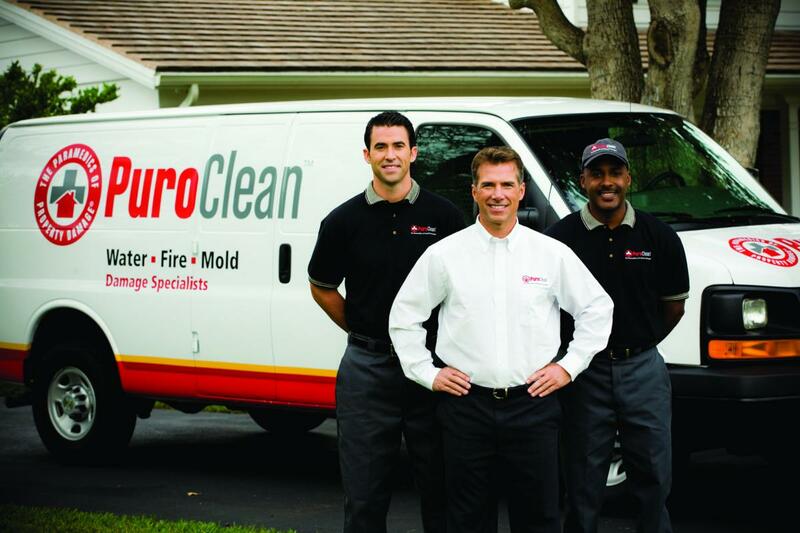 All PuroClean offices have well-trained professional technicians who provide the latest state-of-the-science services to all property damaged from water, fire, smoke, mold, and other disasters.